My stepdad is a man of many talents, and I was pleasantly surprised to learn that among them was a prowess for canning and preserving. Chow-chow, dilly beans, and pepper jelly are some of the many goodies that he has stocked in the basement. A new and unique discovery for me was a jar of--I won't dance around it--extremely unappetizing brown stuff he called chutney. I've worked with a few Indian gals and also peruse many a blog focused on Indian cuisine, so I always thought chutney was more of a thin, saucy accompaniment to their spicy dishes. The Americanized version is quite different--its consistency is more like that of jelly or perhaps relish and it boasts both sweet and sour taste profiles. I was instructed to eat this homemade chutney with some brown beans; it was implied that there was something magical about the combination. I did as I was told, and boy, did I ever love that first mouthful! 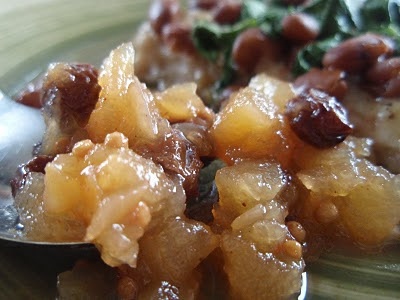 The creamy and slightly salty brown beans were the perfect vehicle for this juicy chutney, which contained pears that dissolved on the tongue, chewy and plump raisins, and tiny bits of sweet onion. There was a bit of heat in the background and a major zap from the vinegar. I could hardly register everything going on in my mouth all at once! I've heard dishes described as being complex, but until now, I don't think I truly knew what that meant. The medley and balance of flavors here is absolutely an experience you don't want to miss! Yes, chutney will definitely brighten up a dish of boring ol' beans, but I wouldn't mind eating it with tortilla chips or--heck, we're all friends here--straight from the jar with a spoon. Combine all ingredients and cook slowly until thick, about 40 minutes. Stir frequently to avoid sticking. Pour, boiling hot, into hot pint jars, leaving 1/4-inch head space. Adjust caps. Process 10 minutes in boiling water bath. Yield = about 7 pints. I've never had chutney before- but you make it sound do good! I love chutney! You are right, it isn't anything like sauce and has chunky bits... Nice recipe! Wowsa - that sounds like one helluva chutney! Your description makes me want to try this, but no I do not have the time to can. How about shipping out some of the good stuff? I can definitely see how complex applies here. What a strange yet delicious sounding combination! I love chutney on a cheese or turkey sandwich but on beans, now that is a new one! Wow what an interesting meal! I would so want to try it :) I should make a batch of this for my dad I know he would love it. The word "chutney" doesn't do much for me, but your description makes me want to give this a go. About how many pears did it take to make 4 quarts? havent had chutney before. but they look good! I grew up with the disturbing brown chutney, and it took a lot of work for my mom to convince me to try it. But I agree that once I did, the flavors were intense and complex and delightfully contrary. I will have to try this version during my next canning-a-thon! I love chutney. First, I love the word "chutney." Second, I love the real thing. So many variations...so little time. I had chutney with pork years ago and loved it but have never tried to make my own. This recipe looks simple and delicious. Beans and chutney? This, I have to try. Love that your dad cans - how fun! Also love chutney, though never had it with beans - sounds like a great combination. man I love chutneys. I'm so glad you do too. And yes, with beans!!! Hello! Skip the chips and give me a spoon, please. Of course this sounds and looks so different from the Indian chutneys :-)This looks fabulous, Grace ! Chutney with beans, what a fantastic idea! I'm a sucker for homemade mango chutney--your pear version is a must-try! I love chutney! It really fancies up some plain roasted meats, and I can't believe I never added it to beans! I've never had chutney before either, I usually stay away from the stuff due to my complex texture issues (complex being that there is no rhyme or reason to what I do and don't like). I'm going to mix me up some chutney and beans. Your chutney looks really delicious! I make chutney from time to time... I will try this one! I am always looking for something new to do with all the pears we get from our trees. Thank you for sharing. Someone once gave me a jar of her homemade chutney. I was afraid of it. Oh, yes! I lovelovelove chutney. I make it with apples, and we eat it with pork. and beef. and sausages. and in tarts. I never thought of combining it with beans, though. This just might be a new food group! Think Charlie might want to adopt me?? This looks both interesting and fun! I loved your post and may have to give this a try! I have never heard of chutney with beans like that but I think you are on to something here. When I think about it, I think it sounds great. Mmmm and made with pears too! Grace your chutney looks delicious with all the ingredients in it :-) Would love to have it with some crackers or toasted lavash...yummie! nicely done.. chutney is a great addition to different dishes! i've never made it before, but sounds like something i can do. Oh my goodness, just the title alone already make me smile. This is utterly delish! It's a good thing I have family in Alabama other wise I'd have nooooo clue what chow chow was LOL. I think I've bought chutney one time (don't remember why) but I think you've convinced me to give it a another try. This sounds delish! I'd love to try this chutney. I wonder how spicy it was? I bet the mustard gave it a kick. Sounds like a real treat with wonderful array of flavors! 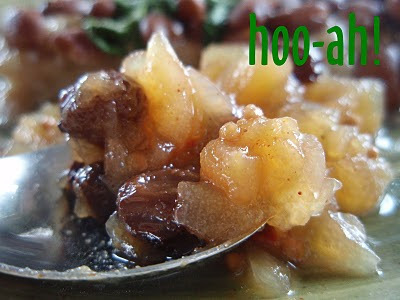 This is something my family would be sure to love with pears & raisins! This chutney looks like a keeper for sure! Chutney. GAG! I am not a girl who likes her sweet and savory mixed, for some reason. I'm odd, I know! I am determined to face my fear of canning this summer. I've heard of canning jam and pickle of course, but never thought of canning chutney! We have a pear tree too, so I can't not make this, really. Can summer come now please?! Oh, I LOVE chutney. Being Indian-American, I've grown up with it too, and lots of different variations. Yours sounds amazing. I love the combination of flavors and spices. And I agree, it's not the prettiest thing to look at, but it is GOOD! My grandmother used to make chutney, but I don't remember what she added to it. It was delicious, as I'm sure this is. You are lucky to have such a talented step-dad that can whip up such a tasty creation! I love all kinds of chutney, and its a great dish that comes in so many varieties! 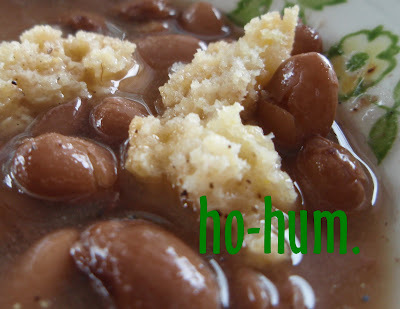 This recipe is new to me but I must try it - I love the sweet and savory of this. Chutney is wonderful...this one, made with pears looks delightful. I love all kinds of chutney. I will have to give this one a try. Thank you for sharing! I remember I was super excited once, at the propect of having mango chutney with my basmati rice. Little did I know it was SPICY...I was deeply upset. This looks like a less scary version! Gotta try it again! Delicious! I always avoided chutneys because for some reason they always sounded (and looked) unappetizing.. until I made some rhubarb chutney when I was visiting my parents and Christmas. Wow! Was I missing out! This pear chutney looks equally delicious. I will have to try it out! Looks beautiful. I like chutneys, I recently explored some really good ones at the Indian market. Fig and lime chutney! My grandfather used to do canning as well. I always thought it was kind of cool he actually got in the kitchen besides to eat! This sounds like a tasty recipe especially paired with the beans. Ooh, chutney with pears! That sounds fabulous. If I can ever get my stubborn pear tree to produce, I'll have to try this. Excellent "medley and balance of flavors " Well spoken! I am sold on this chutney. In the past few years I have grown to love the sweet savory thing. This would be perfect with some soft slices of roast chicken, in a sarnie....hmmm. He's a good man! I love chutney! This looks delicious Grace, I'll have to try making this soon. I'm only familiar with chutneys in the first way you described, but I love the sound of the many flavors of this chunky, tasty chutney. Sounds like your step-dad's got some talent too :)! I love making chutneys, this is a recipe that I will try. Must be so good. I just love chutney. I am about to post another recipe of chutney soon. I so agree about the complexity thing. With beans- yes- yes- yes! Must have that! Lets ee Grace, at this very moment I have brown rice, beans and apple ginger chutney. Thank you for assisting me in figuring out whats for dinner tomorrow. What a flavorful chutney - it sounds so delicious and versatile! I always thought chutney's were a chunky savory sweet jam-y sauce. I bet this would be awesome with pork. Wow, delicious looking, I love chutney but have never paired it with beans...can't wait to try that! That is a surprise, and so interesting. My father-in-law talks about eating lima beans with raspberry vinegar or grape jelly. I guess it is the same idea but I have never even heard of adding chutney to beans. What's more this chutney sounds great. I love chutneys, but I don't think I've ever made my own. This sounds quite interesting! I've never had chutney with beans, but I do love it with cheese! Chutney and beans? That's new to me...I too might have been hesitant at first, but your description definitely convinces me it's worth trying. That sounds like an awesome chutney, too! Honestly? I think we should have a giant foodie potluck campout one week each summer. I am going to have to think about this one. Bloggers unite. Camp. Cook. Eat. Talk. Teach. Share. What could be better? Well, maybe the facilities. It is just easier to know you have a kitchen in a campground than in a hotel. But that might be arranged, too. I love pear chutney. It reminds me of sweet days of summer, sitting around the kitchen table with my aunt, grandmother, mom, and cousins, peeling and chopping the pears for the two day event which resulted in cans upon cans of chutney. Thanks for sharing--it's a good memory of home!